Greece is the home of numerous structural wonders from the ancient times, showcasing the ingenuity of ancient Greeks in the field of architecture. Such is particularly evident in the temples all over the country as well as in the neighboring lands in the Mediterranean. While they do not look as they once did in the time of their completion, one cannot deny that these temples are as marvelous as they are monumental. Primarily, these temples were not really used for worship like how Christians, for example, gather within churches. Greek temples actually served as monuments to the gods—housing the statues or emblems associated with these deities, depending on the cult. Hence, each temple is dedicated to a particular god. Common among Greek temples are their most distinguished feature—the columns. The styles of these columns may be classified into three: the Doric order, with its circular capitals at the top of columns; the Ionic order, with its spiral, scroll-like ornament in the capital of the column called the volute; and the Corinthian order, with its fluted columns and elaborate capitals fashioned with acanthus leaves and scrolls. To name a few, below are three examples of these Greek temples built in the ancient world. The Parthenon is a temple in Athens dedicated to the goddess Athena. Its columns are of the Doric order, though the overall architecture itself is considered as Ionic in style. It was completed in 432 BC—taking fifteen years to be constructed. The temple was built in order to house the colossal statue of Athena, which was made out of gold and ivory. Interestingly, the temple was actually used not only by the Greek worshippers of Athena, but also by Christians and Turks. 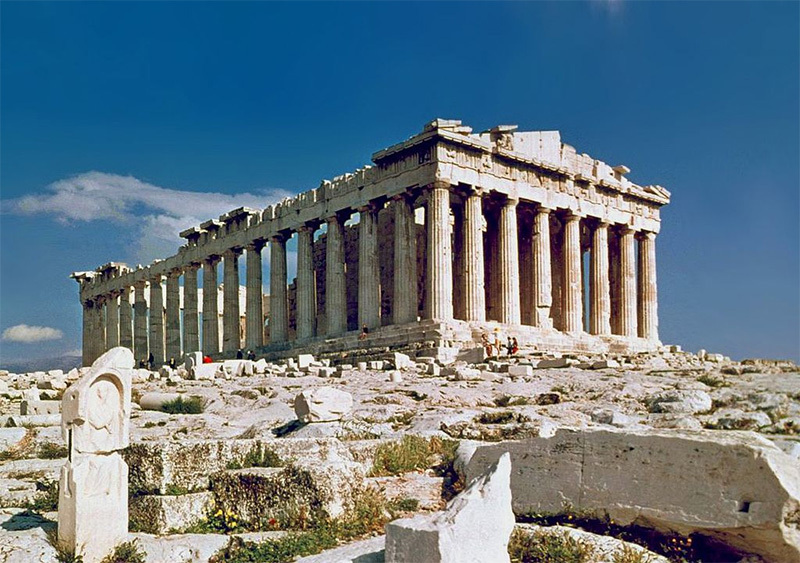 At some point in history, approximately in the 5th century, the Parthenon was converted into a Christian church. Nearly a millennium later, it was then occupied by the Turks, turning it into a mosque. While the temple today is a mere shadow of its glory back in its Hellenistic heyday, a replica of the Parthenon may be visited in Nashville, Tennessee—built in lieu of Nashville’s moniker as the Athens of the South. 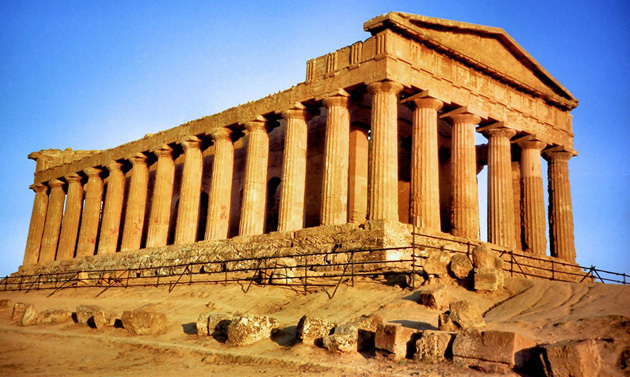 The Temple of Concordia was built around the middle of the 5th century BC in what is now called Agrigento, Sicily. Like the Parthenon, its columns are Doric in structure. Because it is still mostly intact even until now, it is considered as one of the best preserved Doric structures in the world. The temple is not actually dedicated to the Roman goddess Concordia, but it was only named so because of a Latin inscription found nearby which is completely unrelated to it. This moniker was only established during the Renaissance era, and so we cannot be certain about how the Greeks called the temple. In the 6th century, the Temple of Concordia was actually converted into a Christian basilica. It was then dedicated by the bishop of Agrigento to St. Peter and St. Paul. Until 1785, the temple was completely affiliated to Christianity. Also known as the Olympieion, the temple was built over several centuries, beginning in the 6th century BC in lieu of the will of Athenian despots. However, it was the Roman Emperor Hadrian who had it completed in the 2nd century CE. At this time, the temple held the statue of the emperor as well as a gold and ivory statue of the god Zeus, whom the temple is dedicated to. It was also at this time when it was considered as the largest temple in Greece. The Olympieion is situated in the southeast of the Acropolis of Athens, near a river bank. The temple’s columns are Corinthian in structure and it has been said that it originally had 104 columns in total. However, by 2016, only fifteen columns have remained intact and upright. Overall, these are only three among the remaining Greek temples in the modern era. Despite the fragility of these structures due to age, they will always show the richness of Greek history. Hence, the effort put into preserving these temples is admirable because not only are they preserved for their historical significance, it is also because these temples are marks of Greek architectural ingenuity.